Violinist Itzhak Perlman played to a sold out Symphony Hall Sunday. They were line-dancing in the Symphony Hall aisles, several hundred audience members, on Sunday night. The tune was the Yiddish wedding song “Mekhuteneste Mayne” (“My In-Law”); the performers on stage were Itzhak Perlman and a band of klezmer musicians; and the occasion was the 20th anniversary of Perlman’s 1995 PBS special and recording “In the Fiddler’s House.” Klezmer is defined by laughter and weeping, but on Sunday, in a sold-out house, laughter predominated, precipitated as much by Perlman’s hilarious spoken asides as by the music. For all that he’s long been one of the world’s most famous classical violinists, Perlman has klezmer credentials as well. He grew up in Israel, the son of Polish immigrants; Yiddish was his home language, and klezmer was the music on the radio. For this reincarnation of “In the Fiddler’s House,” he was joined by many of the performers from the original project: Andy Statman (mandolin and clarinet), Brave Old World’s Michael Alpert (vocals and violin), the Klezmatics’ Frank London (trumpet), and Klezmer Conservatory Band members Judy Bressler (vocals and tambourine), Ilene Stahl (clarinet), Mark Hamilton (trombone), James Guttmann (bass), and Grant Smith (percussion). They started off with a raucous bulgar, after which Perlman innocently asked, “What did we just play?” When Hankus Netsky, the music director of the Boston-based KCB and the evening’s interlocutor, told him it had been a bulgar from Bucharest, Perlman, deadpan, replied, “Is that Bucharest in Poland?” Perlman later defined the “two kinds of rejoicing” as “Chinese food” and “matzoh balls” and insisted he’d seen Symphony Hall’s 16 Greek and Roman statues dancing along with the audience. The evening ran a tight two hours without intermission. Some of the music was drawn from the 1995 CD; some was not. There was a khosidl from Ukraine and a haytarma from Crimea. 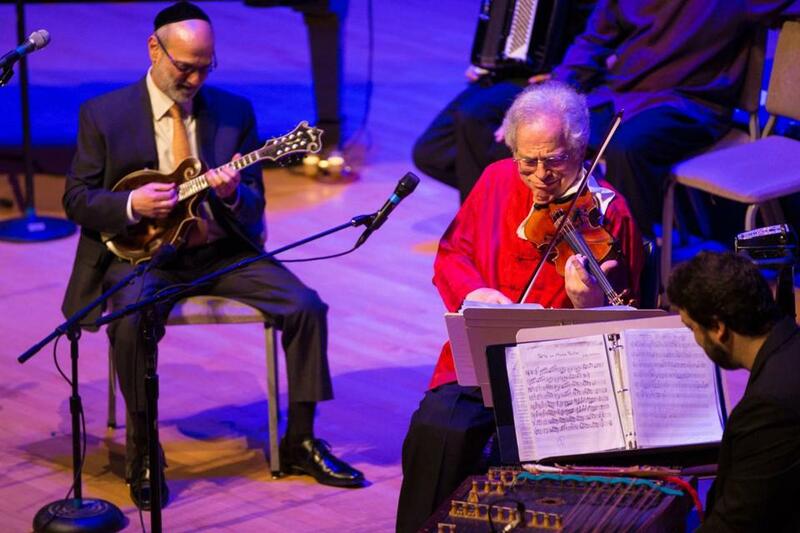 Perlman and Statman played sizzling violin-and-mandolin duets on “Shalom Aleichem” and the Statman compositions “Tati un Mama Tans” (“Mom and Dad’s Dance”) and “Andy’s Ride.” The wedding numbers included “Firn di Mekhutonim Aheym” (“Escorting the In-Laws Home”), which Perlman said had been the processional for his eldest daughter’s wedding. Bressler belted out “Yism’khu” (“You Shall Rejoice”). Everybody joined in on “Ale Brider” (“We are all brothers, and we are all sisters”) and the Passover encore “Adir Hu/ Moshe Emes,” and Perlman took the last line of the Torah party song “Simkhes-Toyres Time,” where “Even the moon and the stars/ Have gone off to drink some wine.” I hope the performers got to drink some wine after the show. They certainly deserved it.